How’s this for a great way to become a vegetarian? 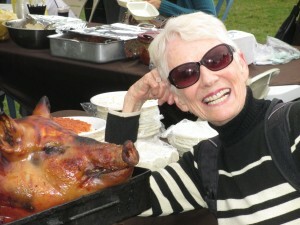 I took lots of full-body, and even half-eaten body-shots, which would convince anybody to forsake pork. Actually, I haven’t tried one of these yummy meals, served outdoors on picnic tables for just a few bucks but I will soon on another walk in the park. That day, I rambled all over Parque Paraiso along the riverfront, looking for the Latin American Festival. When I finally found it, there proved to be only a few white tents serving food from different South American countries and I was already full of a broasted chicken I ate before I met Mr. Piggy here. So, that’s how I spent Sunday, July 20th. This past week, I travelled twice to a small farming town, Paute, about an hour bus ride out of Cuenca. 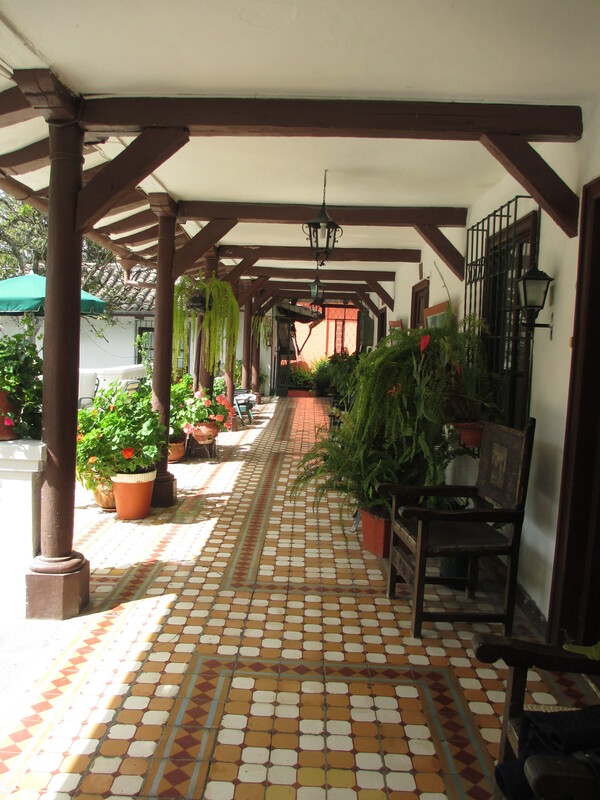 On Thursday, I was part of a small group visiting lovely Hacienda San Juan Pamba, www.sanjuanpamba.com.ec , on a Heritage Tour sponsored by The Gringo Tree, our online, expat newsletter. This former sugarcane and flower plantation is over two-hundred years old and has now become a hotel and conference center, somewhat similar to Paz y Luz, where I stayed during June in Peru. See the porch up there beside me and the pig. We were served appetizers of hot cheese empanadas after a cooking demonstration. And then, ate a huge typical farm meal, with hand-pulled taffy for desert. The Hacienda is a cozy, history-filled homestead, whose sugarcane barn has become the large meeting room. The conference room walls have cavities rubbed by the oxen as they turned the cane grinder over the centuries. These same depressions are also in the opposite wall. It sounds as if the barn was about four feet too narrow and the beasts of burden had to expand things for themselves. Ouch! But, what a great story.